Recently, I have been obsessed with those nice 3D car configurations where you can build your own car. Choosing every single bit of your car can be fun and self satisfactory especially if you're paying a big chunk of money for a Ferrari or a Lamborghini, but what if you're buying normal car ? I guess you would still enjoy it. The new car I love.. 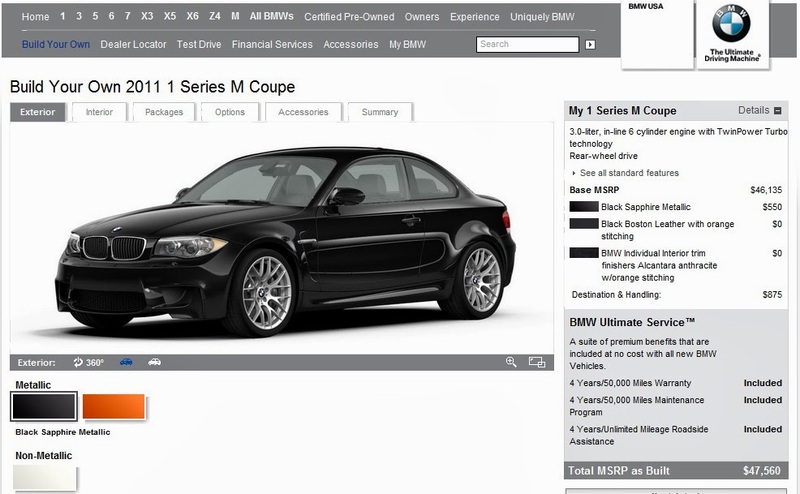 The BMW 1M, not so much to play with in the configuration screen , limited colors and options. but so much fun in real life. That car looks purrrrty! I am thinking of a new car but not now as I don't have a steady income lol hehe :P Hence when I do I will for sure be coming to you for info! It is weird that you liked it! No one agrees with em that the car looks pretty..
and then I can decide what you need and what you want..
Definitely, the 1M Coupe is a cult-classic in the making! The Stig, la testans girls are driving everything now... ive seen some girl driving a shelby here in kuwait.. I Still think the way the car looks and drives, is more manly. They can do everything huh! Cheating Kuwaiti husbands got caught..